Smart phones, internet, and mobile application play an important role in present-day times in all our lives. Online dating business is the future of the internet. Nearly 70% of peoples are using dating application to keep in touch and meeting new peoples. So the entrepreneurs can start their own business using our Online Dating App and earn high revenue from the business. By using our android dating mobile application, the user can find the perfect match for dating in a couple of seconds. In this dating app, you can find best girl or guy to make your first step towards searching the true love. The user needs to provide basic details like name, contact information etc to sign up in the application and login with the valid username and password. In the home page of the Location Based Dating App, the user can search the matches by location and gender. There is the navigation menu in the home page which contains the follows as home, profile, my request, user request, my likes, my favorites, and logout option. After the searching, it shows full details of the results it contains the name, image, personal information like relationship status, height, weight etc. By clicking the ping me button the user can send the request to the profiles and need to fill necessary details like name, email and mobile number to send the request. If the status is accepted, then he/she can able to see the contact details of the matches. The user can see the contact details after accepting the request made by the user. In this Social Dating Android App, the user can make it as their favorite profile and also give likes to that profile. In the profile option, the user can view and edit their profile which is present in the top corner of the action bar. The major features of this Dating Apps for Android are attractive user interface, advanced search option, easy way of finding matches, secure and advanced technology of code, spam protection, advanced photo upload option, send request option, powerful admin dashboard, and many others. We are the leading web development and android development company providing various types of android mobile application to the clients. For this Online Dating App, we provide 1-year technical support, 6 month free updates of the source code and brand free android application. Our Social Dating Android App is more user-friendly to use and makes the user life more romantic and healthy. Dating app is more familiar among the users. 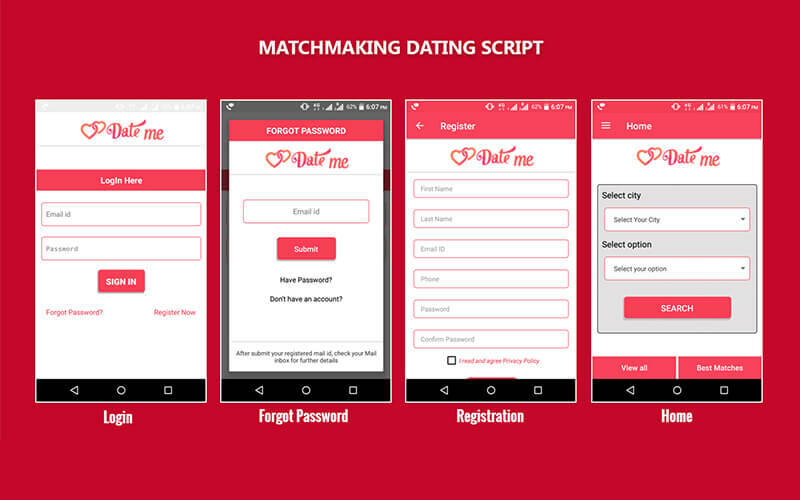 For a startup online business Matchmaking Dating Android Application is highly helpful for you. Team was clearly focusing on customer satisfaction rather than money or projects.